The Mixology Group is now a certified WFA grade provider for WFA Yellow certification. Price includes exam and White WFA tins. This 2 day course covers everything you need to know to start your journey into the wonderful world of flair bartenders. Each day will consist of 5 hours of learning and 2 hours of practice. You have a choice of exam date as each individual student may find they will need more or less time to prepare for the exam, which will last roughly 20-30 minutes. Each bartender will take the exam one by one. This course will grant you a Certification in Flair Bartending on completion; along with a White tin for taking the course, and a Yellow tin for passing the exam. “Flair bartending is the theatrical art of manipulating bar tools with style and grace whilst making exquisite cocktails with precision and speed”. With this new string to your bow you will notice an increase in bar intake, an increase in tips and an increase in your technical ability behind the sticks. You will also notice a new, confident bartender with a higher level of concentration and determination to get better and better. High levels of practice are required to reach the number one spot at the top of the WFA gradings. Which is why we have created a course specifically designed for the eager bartender in mind. With this course you will receive, a Mixology group certification accredited by the World Flair Association, proving you have what it takes to perform behind any bar with character and skill, knowledge of the history of flair, and actual ability to manipulate multiple objects in mid flight, safely and professionally. The earliest record of flair bartending was bartender Jerry “The Professor” Thomas, who poured fiery streams of boiling water and flaming whisky to mix an original cocktail called the Blue Blazer in the late 19th Century. Flair really came into it’s own in the 1980’s when T.G.I Fridays hosted the first national flair bartending competition in 1986 called “Bar Olympics”. John JB Bandy was the winner of this competition and went on to train Tom Cruise and Bryan Brown for the 1988 film, Cocktail. The head instructor Brandon has nearly 10 years experience behind the sticks. With many accomplishments in the competitive field, working alongside the greatest flair bartenders in the world, in some of the best venues in the world, and with his Yellow Grading Teaching Certification, he has dedicated his time, knowledge and passion to create this course fit for all abilities. A simple flair routine combining the whole course. 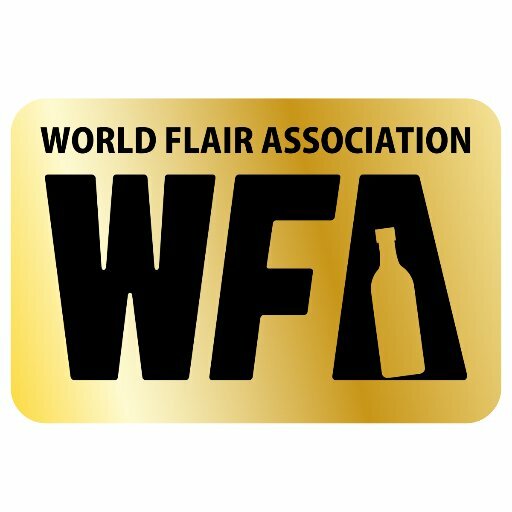 The World Flair Association (WFA) realised that throughout the world, the standard of bartending differs from country to country. So they created gradings to set standards th at can be used no matter where in the world you are. These gradings are colour coded, much like in Karate, Yellow is the first grading with Black being the top grading (1st Place in a grand slam). This WFA Certification will expand on and perfect the techniques learnt in the introductory course. The WFA exam will cover a timed working flair routine, a timed exhibition flair routine and a timed speed round as well as a free pour test. This course is designed as an entry level course and as such is suitable for complete beginners, up to those who have little flair experience and wish to certify their knowledge of flair.